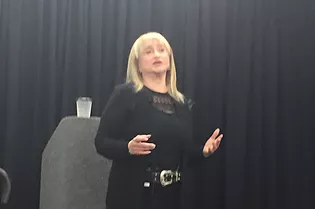 It was such an amazing pleasure and honor to speak at the 5th Annual Trauma Informed Care Symposium in Indianapolis on May 18th. The event was sponsored by the Indiana Department of Child Services for a group of 450 service providers from the IDCS, schools, probation officers, foster parents, guardian ad litems and other state agencies. What an inspiring group! I discussed overcoming trauma from the perspective of caring for oneself while caring for others. While many of the topics explored at the symposium were heavy and disturbing – from domestic violence to human trafficking – I was deeply impressed by the intelligence and dedication of the professionals in the room. I also want to praise Ashley Kumbach (pictured here), who organized the symposium and took such good care of me. Many thanks to Indiana Department of Child Services for the opportunity to share my story with all of these amazing people!